How to draw a Hummingbird pastel pencils in stages? Lessons stelu. How to draw a Hummingbird pastel pencils? Today we will make a sketch of the Hummingbird pastel on tinted paper. Take pastel chalks and pastel pencil on tinted paper (or one that You have on hand suitable for pastels) and a clean rag, because pastel is one of the most easily soiled materials. Sketching a Hummingbird and flower. If the bird's body be broken down into simple forms, we will see that it consists of oval - body and round head, then it's all connected by smooth lines. Beak at Hummingbird thin, rather long and slightly curved. The wings at the moment are at an obtuse angle to the body. Draw the initial sketch hummingbirds. Next, pastel crayons making the first paint over. The breast and belly of the bird of light, and for the head, wings and tail use olive, grey, brown, grey and a bit of black. Flower pink, purple, red. Defining the color spot will retusum touches on the flower, and the bird will continue to draw small strokes. Draw a shadow under the flower Bud to do this, use a purple and grey. And then we continue to gain color. 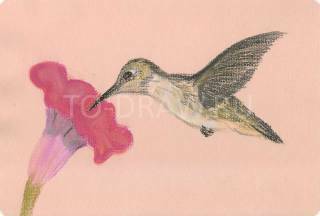 Hummingbirds draw small strokes interspersed olive, grey and black. On the abdomen will put bright colors - brown, a little gray and white. Small touches easier to make sharp pencils. Peering into the slightest change colors and try to convey this in his drawings. This can only be learnt in the process of drawing and closely monitored. Will retusum pastels on the flower and add a shadow. 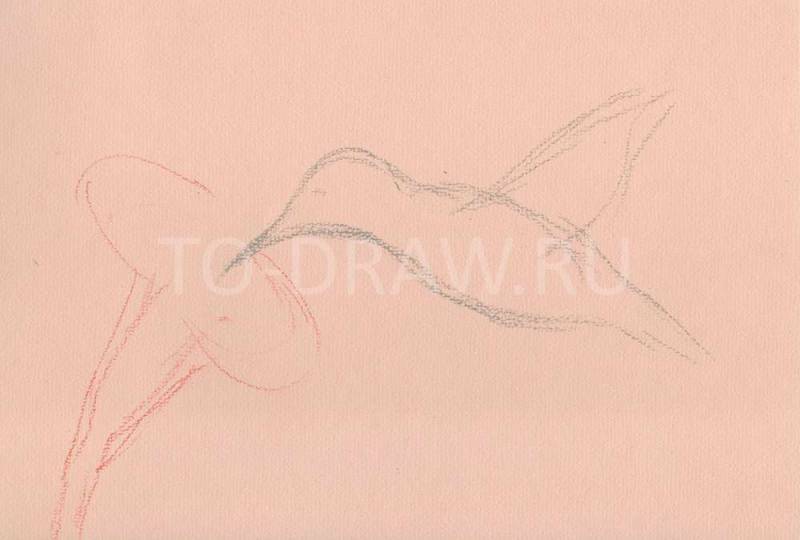 Draw the bird's feet, they are pressed to the body. Our quick sketch ready. You can get more detail picture.